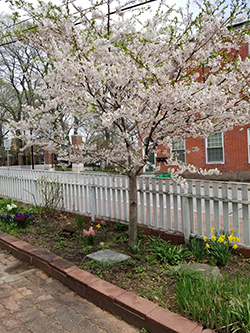 The Portsmouth Peace Treaty Living Memorial Cherry Trees are in bloom all around the Seacoast and across New Hampshire, as a reminder and celebration of New Hampshire history and the citizen diplomacy that helped end the Russo-Japanese War. In Japan, cherry blossom viewing, known as ‘hanami’ is a rich cultural tradition, understood as an opportunity to reflect on the beauty of spring and the fleeting nature of life’s transcendent moments. The ‘sakura’ or cherry blossoms were used as a symbol of soldiers who died too young during the Russo-Japanese War. In fact, the four-volume novel about the war by Japan’s celebrated author Ryotaro Shiba is named Clouds Above the Hill in reference to the drifts of cherry blossoms on the hills of Japan. 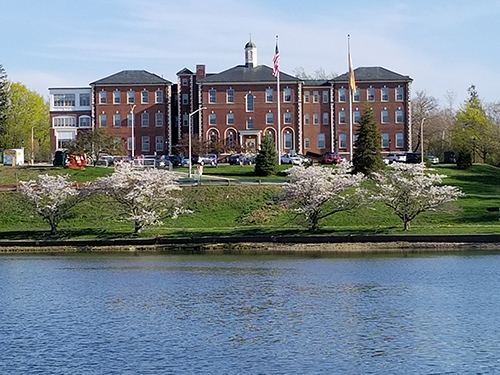 The cherry trees in Portsmouth are particularly noticeable on the bank of South Mill Pond next to City Hall. These were a gift from Portsmouth’s Sister City, Nichinan Japan where Baron Komura the lead Japanese negotiator at the 1905 peace conference was born. The large trees were planted in 1985, the 80th anniversary of the Portsmouth Peace Treaty and the year the Sister City relationship was formed. The smaller trees were planted after the Japan-America Society of NH (JASNH) learned that the iconic Washington DC cherry trees were a gift to the US from the Mayor of Tokyo, ‘in thanks for American help during the Russo-Japanese War.’ America’s key assistance during the war was President Theodore Roosevelt’s skill in orchestrating the peace conference that resulted in the Portsmouth Peace Treaty. In 2012, the 100th anniversary of the original gift of the cherry trees to Washington, JASNH arranged to receive saplings descended from those yoshino cherry trees and started planting them at key Treaty sites throughout the state as a Living Memorial to the treaty and New Hampshire citizen diplomacy. 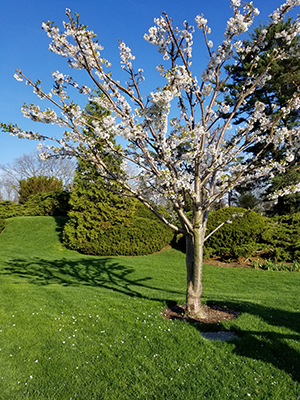 In addition to City Hall, these cherry trees can be seen at Strawbery Banke Museum, the John Paul Jones House Museum, Wentworth By the Sea Hotel, Temple Israel and at all of the Portsmouth public schools. Portsmouth Peace Treaty Living Memorial cherry trees were also planted in Dublin, Hanover, Lancaster, Littleton, Manchester and Meredith. The trees are marked by granite plaques supplied by the Japan-America Society of NH, explaining their Treaty history. CAPTION: Portsmouth Peace Treaty Living Memorial cherry trees bloom at City Hall. 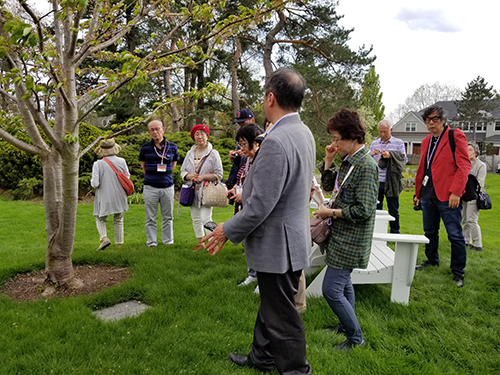 A delegation of 50 Japanese visitors from the Ryotaro Shiba Foundation, including the Director (far right) of the "Clouds Above the Hill" Museum in Osaka toured the Portsmouth Peace Treaty Trail sites (Wentworth By the Sea Hotel cherry tree above) on May 15, 2018. Portsmouth Peace Treaty Living Memorial Cherry Tree in the Community Garden at Strawbery Banke Museum. 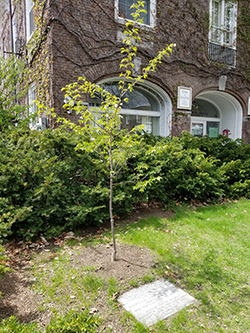 A new yoshino sapling from the National Cherry Blossom Festival in DC was planted at the Dublin Historical Society on May 17, 2018 to replace the previous tree damaged by winter and drought. 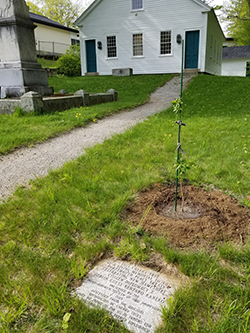 The cherry tree at Town Hall in Hanover NH, placed in honor of Kani'ichi Asakawa, Dartmouth student and author of Causes of the Russo-Japanese War.